Yesterday morning, NASA’s Cassini spacecraft slammed into the day side of Saturn, the brief flash of its vaporization marking the end of a 13-year mission. But it took people to turn this hunk of aluminum and silicon into an extension of our curiosity. For the past three days, I’ve chatted with engineers and scientists at the wooden tables dotting Jet Propulsion Laboratory’s pedestrian mall, and in the sage-scented gardens surrounding Caltech. These are the people behind Cassini’s mission, who shepherded the spacecraft from concept to completion. They are the collective heart, brains and soul that transform its measurements into data. 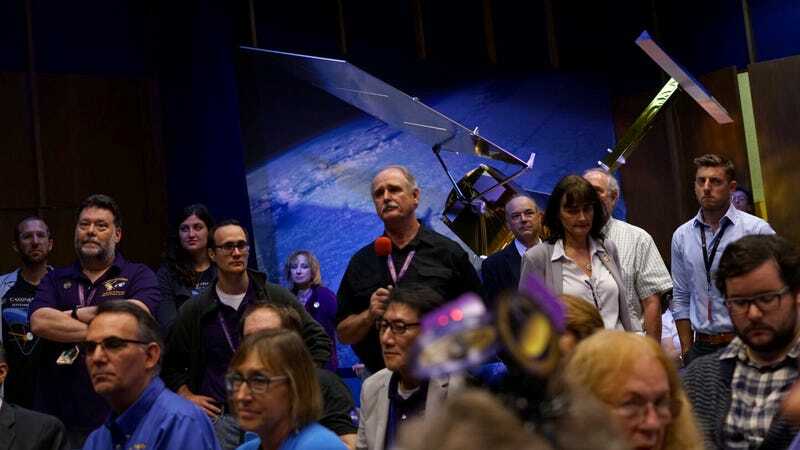 From twenty-seven-year mission veterans to new hires in the past few months, they all shared complex reactions of pride, exhaustion, and sadness when faced with Cassini’s Grand Finale. Trina Rey is another long-time Cassini veteran who joined the team overnight in 1996 to help with “shake and bake” vibration and heat testing during spacecraft construction, and stuck around ever since. “I’ve been calling into operations status meetings for twenty years,” she tells me. “The last meeting is on Tuesday.” The handkerchief she used to dab her eyes is Cassini-purple, perfectly coordinated with her official mission shirt. When I ask Cassini flight controller Joan Stupik how she is feeling, she turns it around on me. “I’m used to seeing how [Cassini] is feeling every day.” New to the mission, she was delighted to share excitement when scientists couldn’t wait to share images of Saturn’s wonky shepherd moons. For her, Friday morning was a bittersweet vigil, participating in the color commentary of Cassini’s final moments. After Cassini vaporizes in Saturn’s storms, its final radio signal lost forever, the uncertain mood shifts and solidifies. A moment of sadness, intensity of emotion overwhelming even those who thought themselves immune, then applause and finally celebration takes hold. “And doing science to the end,” Elachi teases. “For me it was just a piece of aluminum and silicon,” Casani says. “It’s just parts until engineers do something with it.” For all his pragmatism, he lights up when describing his favorite discoveries. “Enceladus,” he declares without hesitation. In its first year around Saturn, Cassini discovered that this icy moon harbored not only a liquid ocean water below its icy crust, but that it had geysers spewing that water into space.“There’s a little, tiny rock in space venting water. It’s incredible.” Elachi holds himself back from interjecting, trying to wait his turn to be interviewed. I spot one scientist in an orange shirt, yet bearing the same Cassini logo. Kareem Badaruddin is a tester for Cassini’s brain, dedicated to finding problems to fix before they emerged in the field. “How are you?” I ask. “Tired,” he says, but the longer we talk the more details emerge. He remembers coming to this same auditorium nearly twenty years ago to watch Cassini launch. His wife was very pregnant with their first child, and unimpressed when a hardware failure forced a launch scrub. They returned to bear witness as Cassini broke free of Earth’s bonds on October 15th, and their son was born nine days later. Family members are here, too, reminders that the unrelenting demands of orbital dynamics stretch beyond awkward 3am press events to witness the spacecraft’s demise. Rosina Maize is proud of her husband Earl’s accomplishments as Cassini’s program manager. But she’s also written the mission timeline on her household calendar for years, turning down social plans for flybys and critical trajectory corrections. “I can be alone on Christmas or invite all these European scientists to our home,” she says, recalling the timing of Cassini releasing its European Space Agency-led Huygens probe on December 24, 2004. In the aftermath of the Grand Finale, the Maizes will be adding a personal note to their celebration. “Yesterday was our anniversary,” she confides.